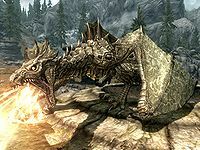 Vuljotnaak is a dragon which can be found flying around its burial site. Although not marked, the site can be found northeast of Sunderstone Gorge and southwest of Sleeping Tree Camp after your first confrontation with Alduin. He has been observed using either frost or fire breath as means of offense. Vul Jot Naak means "Dark Maw Eat" in the dragon language. 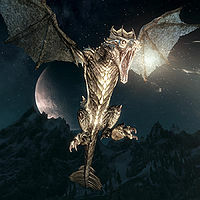 During the time that Diplomatic Immunity is an active quest (after being briefed by Delphine of her plan), you can see Vuljotnaak being resurrected by Alduin. It is mentioned in the book Atlas of Dragons that Vuljotnaak was killed during or soon after the Dragon War. It is possible to find Vuljotnaak resurrected but simply slumbering in his mound. The level of Vuljotnaak is set when you talk to Delphine in Sleeping Giant Inn after Sahloknir is killed in A Blade in the Dark.